Ingredients found in around 80 percent of our processed foods are illegal in other countries. Ingredients found in up to 80 percent of all packaged foods on grocery store shelves in the U.S. have been outlawed in other countries, according to the book Rich Food Poor Food: The Ultimate Grocery Purchasing System (GPS) . 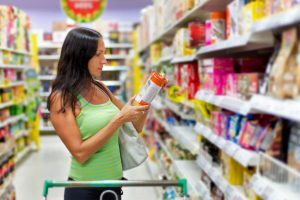 The authors of the book have inventoried the nearly 40,000 products populating the average supermarket today, and created a consumers’ guide of what ingredients to avoid. Dozens of those ingredients are illegal in hundreds of other countries. Brominated vegetable oil – a substance found in Mountain Dew and Fresca which has been banned in more than 100 countries. Food colorings – Food dyes such as yellow #5 and yellow #6 are made from coal tar, an active ingredient in lice shampoo linked to allergies, ADHD, and cancer in animals. Bisphenol-A – BPA is a chemical used in plastic bottles, food storage containers, and in the lining of most canned goods and baby bottles. It’s a known hormone disrupter. It mimics estrogren, causing puberty in girls as young as 7. Canada became the first country to ban BPA in 2010. GM crops – A growing number of countries are banning the sale and/or cultivation of genetically modified crops. Aside from the fact that there are no studies demonstrating genetically engineered organisms to be safe for human consumption, GM crops are loaded with pesticides. Many GM crops are engineered to produce their own pesticides. Others are engineered to withstand heavy applications of the toxic herbicideicide Roundup. Roundup is banned in nearly every European country. Growth hormones and antibiotics. Because of growth stimulators such as ractopine and all manners of antibiotics, more than 160 countries say “no” to U.S. meats. Chemical fertilizers. From 1990 to 1995, 600 different companies from 44 states sent a whopping 270,000,000 pounds of toxic waste to both fertilizer manufacturers and farms. The waste was not treated to remove toxic substances including arsenic and dioxins.